With no deal imminent on the looming "fiscal cliff," President Obama, who cut his Hawaiian vacation short today, has summoned congressional leaders to the White House for a seemingly last-ditch meeting on Friday, CBS News has learned. The two key congressional leaders, Senate Majority Leader Harry Reid, D-Nev., and House Speaker John Boehner, R-Ohio, will be joined by Senate Minority Leader Mitch McConnell, R-Ky., and House Minority Leader Nancy Pelosi, D-Calif., at Friday's 3 p.m. ET meeting, which marks the first time the four are meeting with the president since Nov. 16. "[W]e'll see what the President has to propose," McConnell said in a statement. 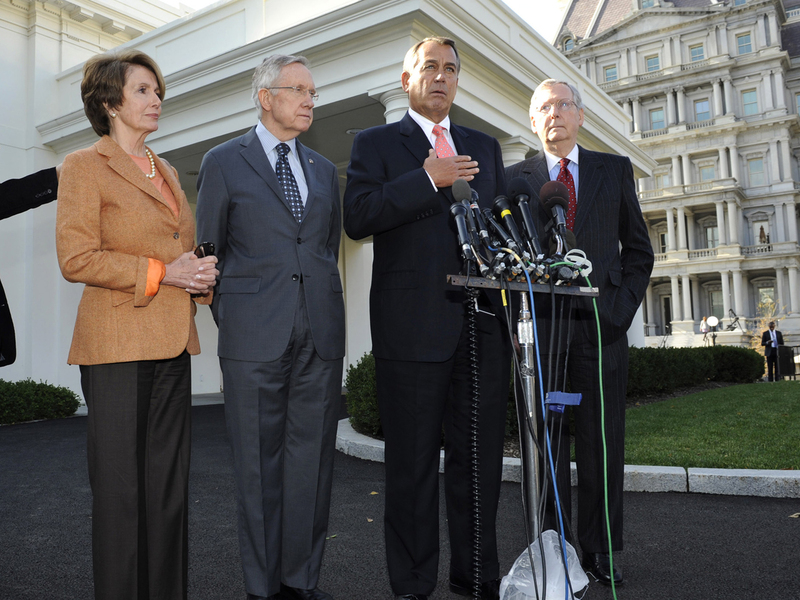 "Members on both sides of the aisle will review it, and then we'll decide how best to proceed. Hopefully there is still time for an agreement of some kind that saves the taxpayers from a wholly preventable economic crisis." More in The "Fiscal Cliff"
Meantime, on a conference call with the House GOP Conference this afternoon, House Majority Leader Eric Cantor, R-Va., told Republican lawmakers to be prepared for votes on Sunday night. All of this action is not indicative that progress is being made on the tax hikes and dramatic budget cuts set to go into effect next Tuesday, however. On the same conference call, Boehner reiterated to his conference that the ball is in the Senate's court. He called on Senate Democrats to pass legislation the Republican-led House passed earlier this year that would extend tax rates for all wage earners and another measure that would replace the across-the-board spending cuts to domestic and defense programs with targeted cuts. "The House will take this action on whatever the Senate can pass - but the Senate must act," Boehner said. But Reid had a similar message for Boehner earlier in the day: "Take the escape hatch we left you." Reid: Time is running out to avert "fiscal cliff"
Reid called on Boehner to take up a bill the Senate passed weeks ago that would extend current tax rates for all wage earners making less than $250,000. "The way to avoid the 'fiscal cliff' has been right in the face of Republican leaders for days and days and days...," he said. On the floor of the Senate this morning, Reid said Boehner "seems to care more about keeping his speakership" than avoiding the tax hikes and federal spending cuts set to go into place in just five days. Reid's focus on criticizing congressional Republicans today instead of moving a proposal forward was part of a calculated strategy, Democratic aides tell CBS News. The aides said Reid is not going to introduce his "fiscal cliff" bill unless McConnell promises he will either allow a straight up-or-down vote on the measure, requiring just 50 votes, or allow Senate Republicans who might support the bill to "vote their conscience" - to vote yes - enabling the measure to meet a 60 vote threshold. McConnell has yet to give those assurances, and until Reid gets them, he won't introduce his bill, the aides said. Democrats believe Reid's ultimate bill will be the inevitable legislative solution and they don't want to risk anything by sending it to the floor only to see it voted down. Also, they don't want to force their own members to take a tough vote on a bill that winds up failing. The latest stalemate over the "fiscal cliff" comes after Boehner's Republican Party rebuked his efforts last week to avert the "cliff." He was forced to pull a bill from the House floor just minutes before the expected vote because Democrats refused to back the measure because it doesn't raise enough revenue and too many Republicans revolted, refusing to raise taxes on anyone. The measure would have raised marginal tax rates only on households making more than $1 million. Adding to the urgency, Treasury Secretary Timothy Geithner said the debt limit will be reached earlier than expected. In a letter to Congressional leadership, Geithner said that as of December 31, the U.S. will reach its debt limit and that the Treasury will have to take "extraordinary measures" to avoid defaulting on its borrowed obligations.